Surviving a plane trip with a little one is always a challenge. We have some helpful tips to help keep the turbulence to a minimum. Actor and funniest Twitter-dad Ryan Reynolds summed up many parents’ fears when he said he’d “rather drink a piping hot bowl of liquid rabies than get on a plane” with his children. But you can survive a long-haul flight with a baby, says Nikki Wallman – here are some tips. 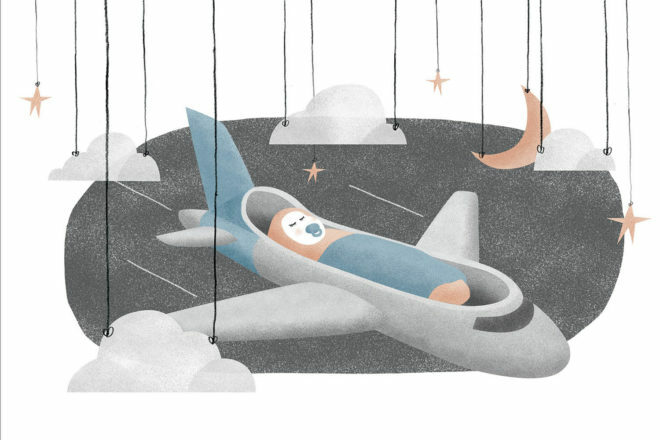 Flying long-haul with a baby is fraught with questions, both practical and existential: Will he/she sleep? Cry uncontrollably? Make me question my life decisions? But as someone who’s been there a couple of times (Europe at eight months and South Africa at 14 months), I can say that while it ain’t easy, it’s do-able. Every baby (and parent) is different, but here are a few tips that might help. For this story I contacted Christine Minogue, a Mothercraft nurse with 30 years’ experience, she’s the author of Bringing Baby Home and a regular on Kinderling radio. She also helped us with planning our long-haul flights with our son. Did I mention we love her? With her decades of experience Chris still finds that parents’ biggest fears when doing long-haul with a baby are ‘will they sleep, and will their crying affect people around them’. She says with planning and preparation, most do pretty well; and that “people are more tolerant than you think”. Chris suggests long-haul flights at night where possible, when your baby is likely to sleep better: “We are lucky in Australia as we have some great night flights going into Europe.” These often arrive around the middle of the day, giving you some daytime to start adjusting. We also enlisted a travel agent, who helped our addled new-parent brains with securing a bassinet seat, and ordering vegetarian meals for me (special meals are served first, allowing me to scoff while my husband looked after the baby). Stick to the essentials for carry-on – you’ll have your hands full as is. Baby carrier: Perfect for walking up and down (…and up…and down…) the plane; also great for the airport. If you prefer a travel stroller in transit, check with your airline: “Not all security will allow all prams through to the gate, so you may need to use a carrier,” says Chris (and check the stroller in). Research the best fit for your baby’s needs (and the airline’s size restrictions, if aiming to carry it on-board): the GB Pockit stroller gets rave reviews; we used a Baby Jogger City Mini Zip. Something to help your baby sleep: Whether it’s a simple muslin cloth you can drape partly over yourself or the plane bassinet (always allow air to circulate), or something like the CoziGo. A backpack: Frees up your hands. To avoid pulling everything out in an emergency, we put a nappy and wipes inside individual disposable nappy bags, tying them up to create ‘changing kits’. We also packed change mats; extra wipes; favourite food pouches/snacks; sleep gear (comforter, dummies) and spare clothes. A lightweight scarf is a great multitasker (lining the bassinet; hiding clothing stains); and baby books, a couple of toys (favourite and new), even iPads are handy distractions. Factor in plenty of extra time: urgent feeds or nappy changes; extra equipment, and the general chaos of airports can all invite meltdowns (from baby or, erm, parents). Try feeding (bottle or breastfeeding) on take-off to help relieve ear pressure and calm your baby. “On the flight your baby will generally need fluid every three hours,” says Chris, notwithstanding a decent stretch of sleep (#thinkpositive). We sketched out a rough timeline of sleeps and feeds based on our son’s usual schedule, which gave us some illusion of routine to cling to. If you’re breastfeeding, keep well-hydrated; if bottle feeding, Chris suggests asking for 2/3 bottled water and 1/3 boiling water, and then adding formula to the bottle (you’re also allowed to carry a ‘reasonable quantity’ of liquids – milk, sterilized water, etc – onboard for your baby). It may take longer to settle your baby to sleep (we did a LOT of aisle-walking) – Chris advises wrapping their arms to their body, and cuddling until calm before placing in the bassinet or letting them sleep on your lap. Seek out other babies to play with, and friendly looking hosties (ours on Emirates took Polaroids). We really did find most fellow passengers could see we were trying our best – we were all babies once, right? yes, it all sounds fabulous, and some babies are sooo well behaved, but others do not cope. i wonder if parents are allowed meltdowns, probably it is the reason why babies do not cope. so unless parents are prepared to travel well, do not attempt long haul unless you have done short flights first. alternative is to train by sitting in a boring room for hours with your baby on your lap, and seeing how both cope. training a baby and the parent may be the best formula for success. in the end even the best laid plans can come to nothing and this is where the adult is called upon coping. most other travellers will forgive a crying baby, but sadly, not the parents.